Majestic Sun 902B-Upgraded 2bd deluxe condo w/ gulf views & private parking. Indoor/outdoor pool, fitness, & hot tub! Come and relax at one of Destin's most luxurious high-rise condominiums. This lovely 9th floor condo features a king bedroom, two twin beds, 2 bathrooms and a sleeper sofa for the kids. Enjoy the fully stocked & upgraded kitchen for your meal times. There are granite countertops, custom cabinerty and stainless steele appliances. The open floor plan will allow you to connect with everyone in your party. Enjoy the convenience of a full size washer & dryer right in the unit. After a long day of fun and sun take in the breath taking panoramic Gulf views from your oversized balcony! The owner just had all new wood like tile flooring installed in November 2018. All of the bedspreads and the two twin bed frames are new as well as of December 2018! The highlight of the condo's endless amenities is a multi-level indoor/outdoor pool, fitness center, and hot tub. So whether you want sun or shade you have at all with this pool and deck area. The pool is heated seasonally for your comfort. You are just steps to the most beautiful sugar white sandy beach of Miramar Beach, FL. Majestic Sun also has covered parking. Additionally, Majestic Sun is located on beautiful Seascape Resort with its 18-hole championship golf course, conference center, eight tennis courts, fresh water lakes and lovely park grounds. 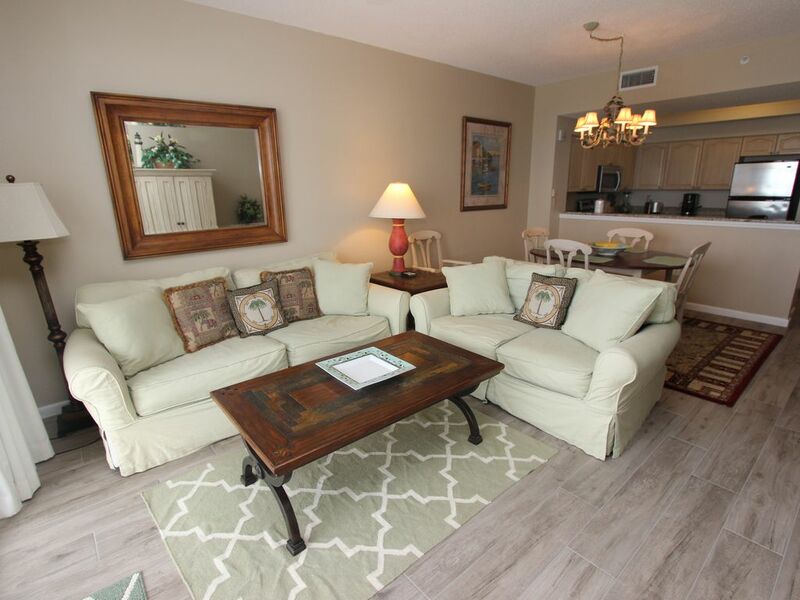 This family vacation resort is convenient to casual and fine dining restaurants, shopping at Silver Sands Factory Outlet mall or Destin Commons and the area's many attractions. You are just steps to The Whale's Tail and the Cabana Club for dining, entertainment and refreshments. Who could want any more than this! Stay at Majestic Sun 902B and experience the luxury of the Beaches of South Walton. Unit 902B comes with one underground parking space. Additional vehicles can park in the 3 story parking garage. Each guest will receive up to 2 free parking passes. Each additional parking pass will cost the guest $10 which is payable by cash only. Guest will be required to pay for the extra parking pass upon arrival. Enjoy breathtaking views from the living room, master bedroom, and extended balcony! The unit comes with one private underground parking space. All other vehicles can park in the three story parking garage located behind the A building or in any open parking space outside. The living room has a sofa sleeper, love seat, armoire with Flat Screen TV and balcony access for viewing the beach! This condo has a fully equipped kitchen with granite counter tops & stainless steel appliances. Flat screen TV's in the living room and both bedrooms! You have access to the tennis courts that are located on the Seascape Resort for a fee. Call ahead to reserve. The Seascape Golf Course is located behind Majestic Sun. You have access for a fee. There are several other golf courses nearby for a fee. Majestic Sun is conveniently located within walking distances to three restaurants! Majestic Sun is one of Destin's most sought after properties because it has an indoor heated pool, outdoor pool, and two hot tubs. Majestic Sun is conveniently located on the Seascape Resort and is within walking distance to three restaurants. There are several other shops and restaurants within a few miles of the property.